Cleaning our face is something that we have all heralded as key to good looking and healthy skin for years. With the use of make-up, pollution and the constantly varying weather it seems increasingly important to ensure our skin is clean ans has a chance to breath. But what is the best method to really get a properly clean and healthy face rather than just one that looks like that at a glance? Anything that just requires you to wipe across your skin isn’t going to be enough to pull out all the impurities and dirt. There are face masks that are supposed to pull out those really deep unwanted issues and make everything feel a lot nicer but for many people these are too time consuming to do on a regular basis. So exfoliating has become a really big thing in recent years as it is effective and can be done with relative speed too. From a gentle daily method to a more intense weekly one there are choices and products available for everyone. For me, with large pores and dry skin, I find the sensitive setting on my Magnitone Full Monty to be absolutely perfect when combined with my favourite gentle cleanser. It really helps to get rid of the excess dirt and make-up, that the face wipe I use before hand, is well sunken in and hard to remove. I like to use a more intense setting once a week which really helps my skin to feel a lot more fresh and alive. Using the Magnitone has really improved my skin softness, quality and appearance and even seems to help my make-up go on a little more seamlessly. The body exfoliating brush and pedicure pad are fantastic aswell and really help the whole body to feel softer and more delightful meaning I can reduce the amount of body butter and foot creams I go through! 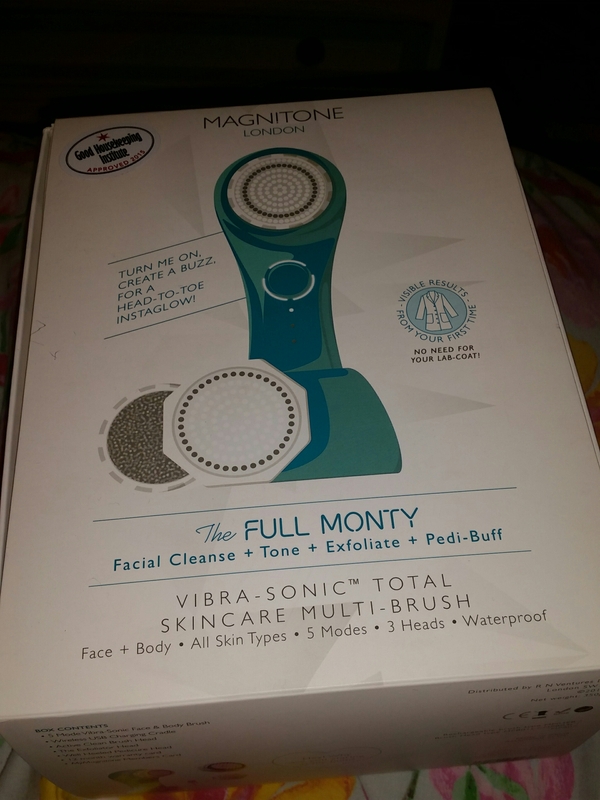 Thanks to Fashion Mumblr for sending me the Magnitone Full Monty after I won her Vlogmas giveaway. This entry was posted in Beauty, Skincare and tagged bblogger, bbloggers, beautiful, Beauty, beauty blog, beauty blogger, beauty bloggers, beauty product, body, clean, cleaning, cleanser, exfoliate, exfoliating, face, face mask, face wipes, fashion, full monty, Health, healthy, lblogger, lbloggers, Lifestyle, lifestyle blog, lifestyle blogger, lifestyle bloggers, magnitone, Make-up, mua, pamper, routine, Skincare, spa, style. Bookmark the permalink.